Waverley will make her first move of the year this Friday, when she heads down-river from her Winter berth at Glasgow's Science Centre to dry-dock in Greenock. 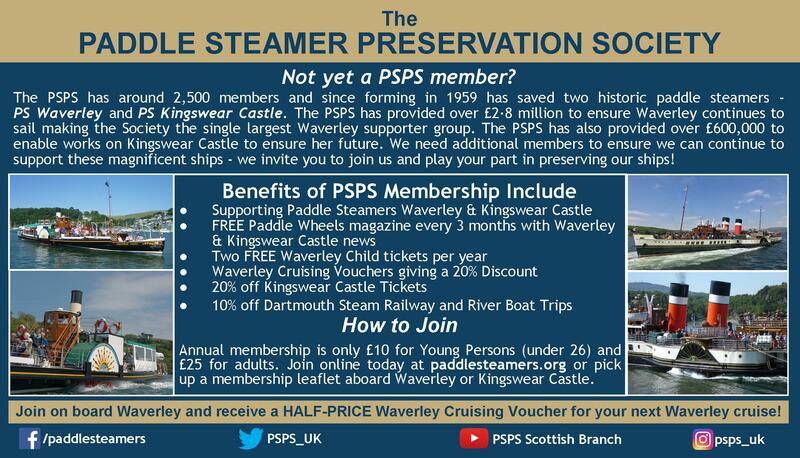 A spokesperson for Waverley Excursions commented: "Waverley will be under tow as she moves to Greenock, while refit work is completed on the ship's boilers. Dry-docking signals the final phase of the Winter maintenance period, and we acknowledge the effort of all our full-time crew, as well as the volunteers who help reduce the cost. Even with this valued volunteer support, and with practical assistance from companies like BAE Systems of Govan, we spend around £400,000 on maintenance every year to keep Waverley ship-shape." Following dry-dock, Waverley will return to Glasgow and final preparations for the sailing season, which begins on Thursday 23rd May. Over the May Bank Holiday weekend, the historic paddle steamer will offer four days of sailings in the beautiful scenery of the Clyde. These include a cruise round the island of Bute, and a rare trip from Glasgow and Largs around the Mull of Kintyre to Oban.